Post-apocalyptic dystopias have long been a theme of science fiction, and the growing public awareness of global warming has recently been finding expression in fiction. A trilogy (Forty Signs of Rain, Fifty Degrees Below, and Sixty Days and Counting) by Kim Stanley Robinson, completed in 2007, was set in a climate-changed Washington, DC. 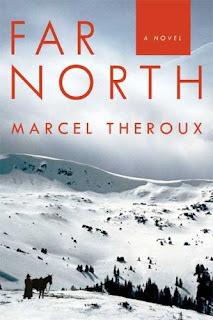 Marcel Theroux's homespun tale about a solitary frontier survivor conjures up a monolithic world that's ominous and deeply memorable. He depicts a bleak Earth transformed, perhaps a century or two from now, by global warming and a society reduced to a mostly empty, radioactive husk; the remnant peoples are violent, ignorant and few and far between. Against the gray backdrop of abandoned towns, poisoned cities and occasional wildlife, a tough, hardy frontierswoman named Makepeace struggles to eke out a living on the strange and swiftly changing land. The book is being published Tuesday (June 9) in the U.S. after having been released in the U.K. in March; it was reviewed by the Telegraph and the Independent at that time. The book was also reviewed recently by Strange Horizons. The Russia! magazine blog has pictures and videos of an extremely rare damaging tornado in the town of Krasnozavodsk near Moscow on Wednesday (June 3). 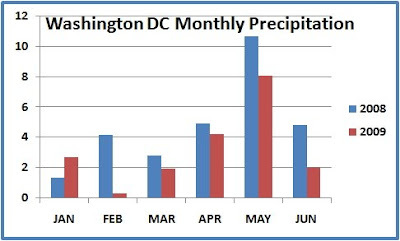 Although the first 5 days of June have gotten off to a roaring start, so far in 2009 the only month to exceed 2008's precipitation total has been January. With another half an inch plus recorded through 1 pm today, this month still has a way to go to reach the 4.8" in June 2008, which was 53% above the average of 3.13". The rainfall bounty has also not been shared evenly across the broader region. Many outlying areas in Maryland and Virginia are below average for the last 30 days. The House Committee on Science and Technology yesterday passed H.R. 2407, the National Climate Service Act of 2009, by a vote of 24 to 12. A bipartisan amendment by Rep. Brian Baird (D-WA) and Rep. Bob Inglis (R-SC) postpones the creation of a new organization by first setting up a "Climate Service Program" within NOAA. A 3-year process is then defined to develop a "collaborative, interagency research and operational program" and evaluate alternatives for implementation. The evaluation process, to be carried out through the Committee on Environment and Natural Resources (CENR) of the National Science and Technology Council, is required to report its results to Congress within 2 years along with a plan for establishing the National Climate Service. In a climate that is changing, it is imperative that we have reliable information to help us adapt and respond to these changes. My amendment puts in place a mechanism that will allow the best minds from every relevant federal agency to share information, and ultimately decide on the best structure, and organizational home for the National Climate Service. By doing this, we will ensure that when the National Climate Service is created, it will be better able to identify the problems created by global overheating, and armed with this information, better able to find solutions. After having run up 20% in the past week (as much as 10% yesterday alone), natural gas prices following the forecast announcement have been down less than 2%. At Dulles, whose records began only in 1963, this ties the May record set in 1988, but is well short of the June record of 18.19" in 1972. Baltimore's total beats out the 7.77" last year to claim second place behind 8.71" in 1989.